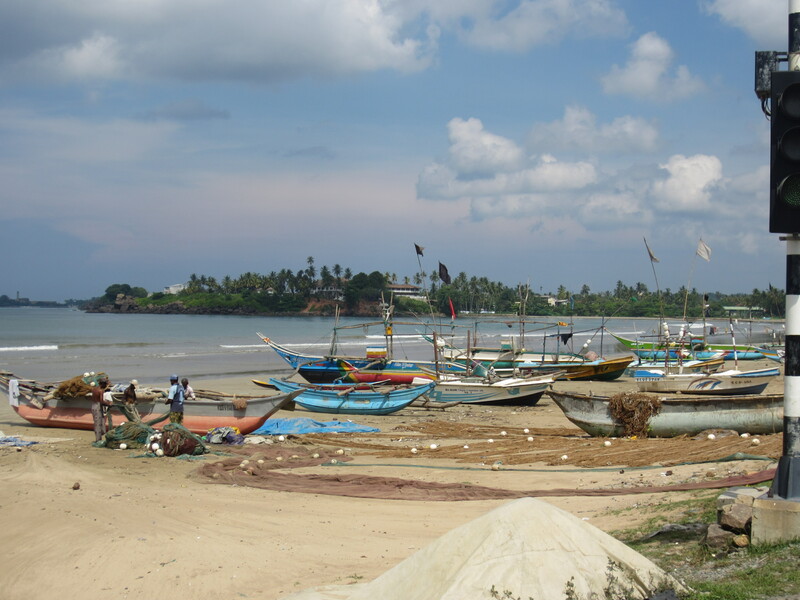 As we drove by Weligama beach from Tissa to Unawatuna, we saw dozens of large boats with outrigger pontoons beached high and dry. 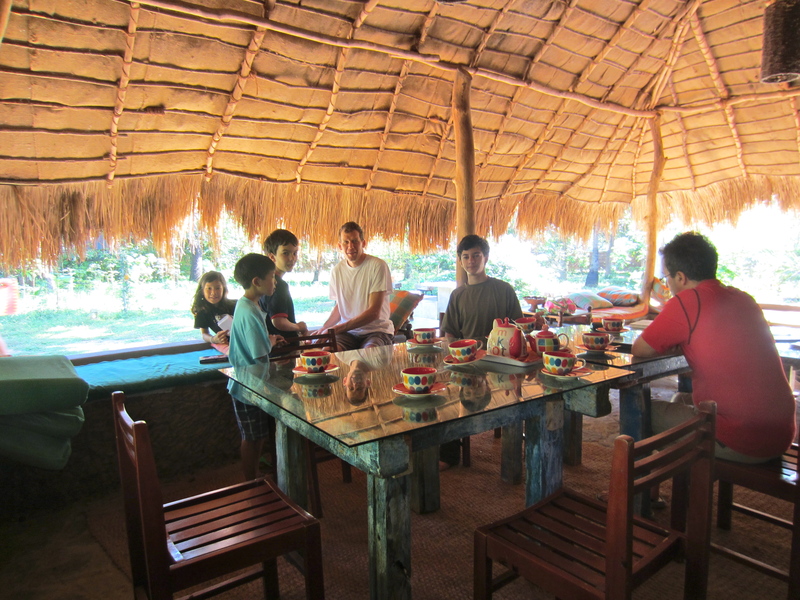 Along the road were also dozens of wooden huts with fish laid out on wooden tables under shade awnings. No electricity and thus no refrigeration. This fish was fresh and the fisherman needed to sell them. I imagine the older, more odiferous fish would simply end up in curries, their slightly rotten nature masked by the abundant Sri Lankan spices. The fish we ate while we were here was simply fresh and delicious. and go out ocean fishing. It would be just Bernie, me and the kids. 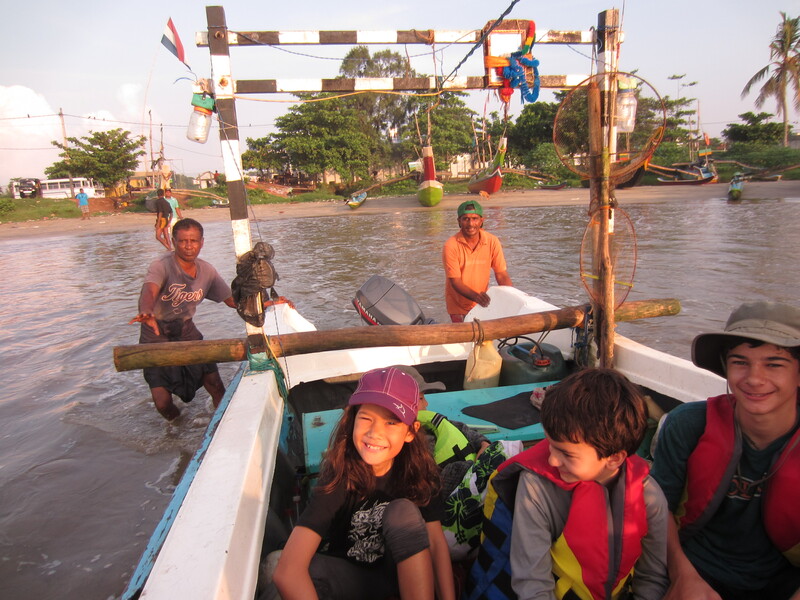 Pearl and Gigi’s sense of adventure does not extend to cramped fishing boats bobbing out on the Indian Ocean. Their loss, or maybe I will leave such judgement to my readers. We were up and out and tuk-tukking our way to a beach just outside the Galle fort walls. 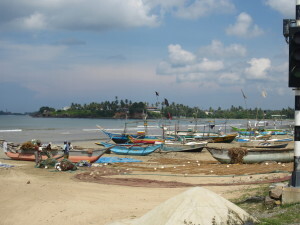 At the beach, there were already fishermen selling their catch from the roadside stands. We looked around and saw tuna (one was 56 Kg and at least 10 inches in diameter, the others all way puny in comparison), a small dorado, rockfish, sardines, and a few other types I could not name. The sea looked to provide a good bounty. One fisherman commented, ‘When the sun comes up, you can’t catch fish.’ We hoped he was wrong. Our fishing vessel was not one of the boats on the beach, they were high and dry until the next high tide. Our boat came around the point and pulled into the cove. It was maybe 4 meters in length and was fiberglass and powered with a 15 hp outboard engine. We waded knee deep into the water, put on life vests and jumped into the open boat. This was an unexpected bonus, I wonder how hard it was for them to find 6 life vests. 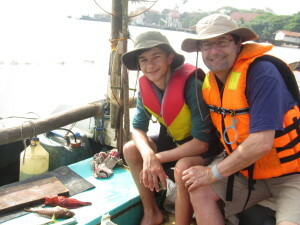 The kids sat on a fishing net in the bottom of the boat, Bernie and I leaned against the sides. Off we went with the Galle fort on our right. Ahead of us was open ocean, all the way to Antarctica. We began to encounter some gentle rollers, but the captain turned to the left and got closer to the shore and the rolling of the sea lessened. I am always worried about getting seasick, but I was OK. Justin and Izzy both got a little green, but everyone made it back to shore with stomach contents intact. We were fishing for rockfish, and really to my surprise we did not get skunked. Our first fishing spot was quiet, and after only 20 minutes the captain weighed anchor and found a new spot 10 minutes cruise further along the shore. Here, we caught fish. Jordan was the first. 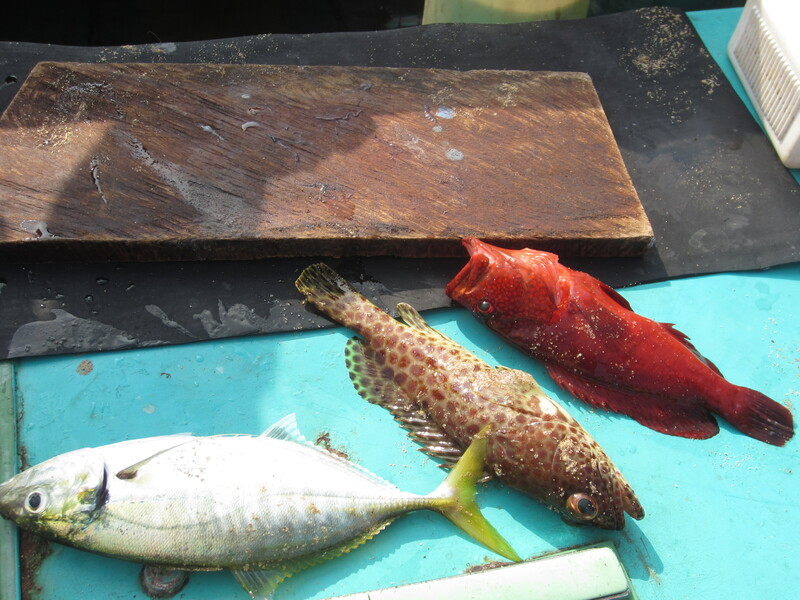 He caught a small grouper with brown skin and white spots. He actually did not know he had a fish for a while, it was so small. The captain and Bernie both caught similar sized, but very different looking fish. We were fishing with lines from large spools, no rods. The hooks seemed a bit small for deep sea fishing, and probably were gauging by what happened. Bernie, Jordan and I all had the experience of our line getting extremely taught, mine almost felt like I had hooked a rock or heavy seaweed. However, I was able to hand reel in quite a bit of line before it became slack. My leader line had broken. The fish on Bernie and Jordan’s line simply shook the hook. Our non-english speaking crew (captain plus his nephew as crew) did not react at all to the fact that we had lost 3 fish that might have been a decent size. Oh well, we had landed 3 fish, no matter how small, and had the experience of spending a few hours with local fishermen. The sun was rising in the sky and getting hot by 9 AM, so we all pulled up our lines and headed back to shore. We got back to the mansion and packed our bags. We loaded up the van, and Indra took us through the old portuguese/dutch/english fort of Galle. This is a UNESCO world heritage site. It was hot, so we did not explore much. We did see an old-time snake charmer sitting on the roadside with the classic, bulbous flute and a baby monkey on a leash. Two covered baskets and a burlap sack sat in front of him. We stayed in the van and had Indra get out and give him some money for a show. Out came the python from the burlap sack. Our boys have held pythons multiple times, so this was not so exciting. The excitement came when the tops came off the basket revealing two cobras. He agitated them both so that they rose up and opened their hoods. He used the basket tops to make them sway back and forth. 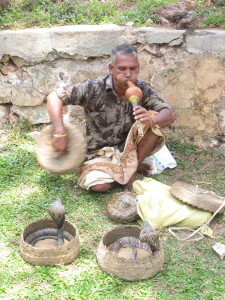 I had heard that these snakes are defanged so there is no danger for the snake charmer. This must be true, as I saw one snake bite his hand as he was reaching to shake the snake’s basket. After 5 minutes, we had seen enough of the show. 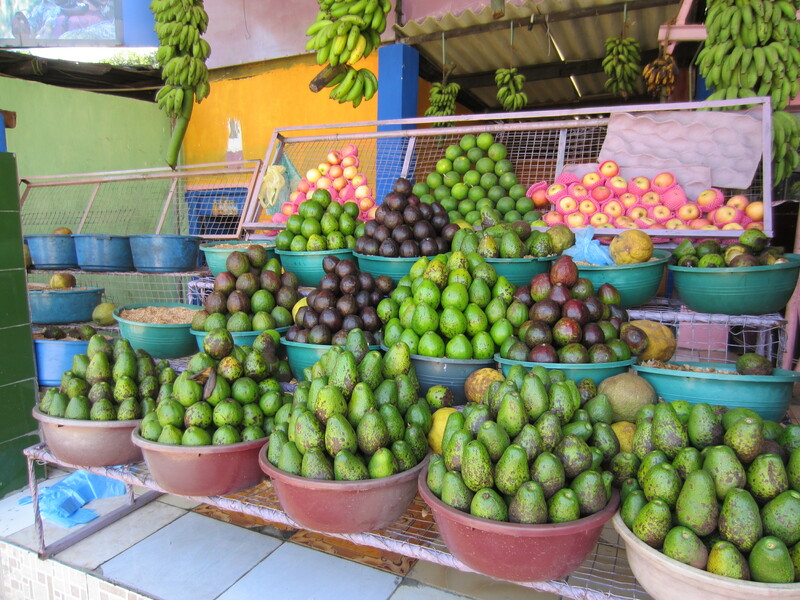 Next stop was an open air market in a small plaza overarched by giant trees. Here, Gigi and I found yet another Small World encounter. A man with a french accent was manning a book stand that had a book on tea culture that Gigi really wanted to purchase. When we told him our story and that we lived near St. Tropez, he said he had lived in Ramatouelle and sold T-shirts in the St. Tropez marche years ago. We had been to Ramatuelle several times because our only local french friends lived in that town. There is quite a lot of distance between Ramatuelle and Galle, but there you have it. Paths crossing. 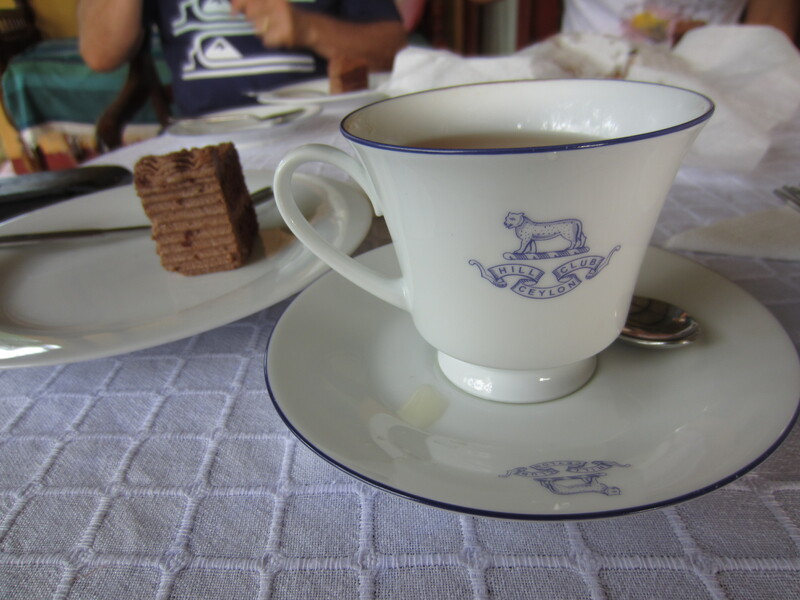 When we were in the highlands we visited the Glenloch tea factory for buffet curry lunch and a plantation tour. This was quite the tourist stop, but as it was our first day in country and a visit to a tea factory was a top To Do thing, we were quite happy to have ticked this activity off our list. All good, we learned about tea, the scenery was beautiful, and we drank and bought tea. 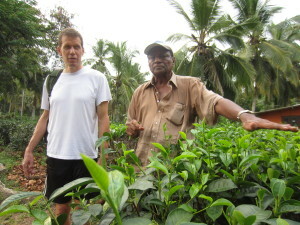 Today, we spent time with Herman at his lowland tea plantation near Galle. 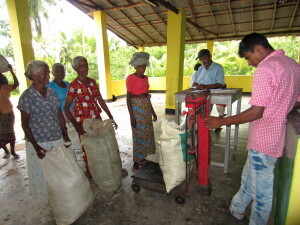 This was visit was totally different from our first tea plantation visit. 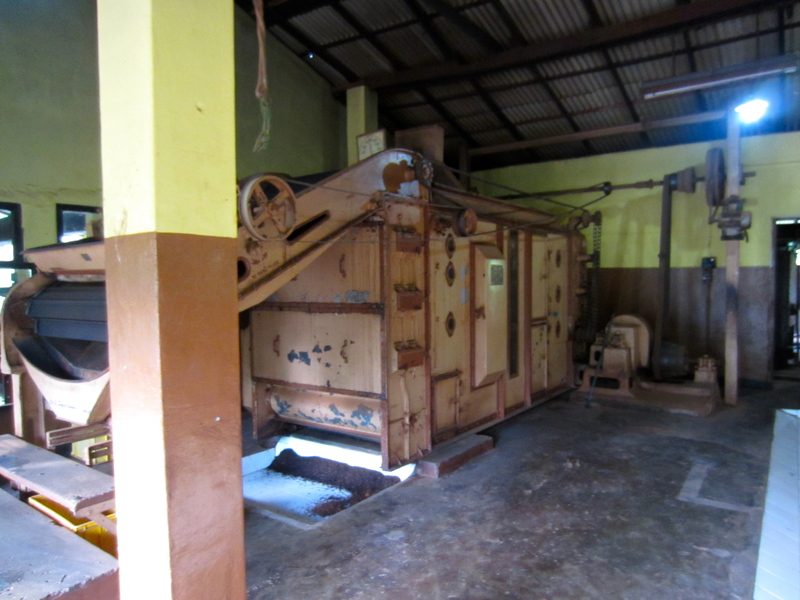 First of all, the draw was that this tea plantation sold white tea harvested untouched by picker’s hands. The picker’s used gold plated scissors and snipped the white tips into bowls. This mimics the story from ancient China that virgins similarly harvested tea so that the emperor’s lips were the only thing human that touched the tea. That story, along with the highest recorded antioxidant percentage – 10.11% – of a natural beverage has made this tea exclusive, much sought after, and quite stratospherically expensive. We had to visit this plantation as it was only about a 30 minute drive from our mansion. Now, what made this afternoon truly special was that Herman himself took us on a tour of his plantation. The landscape was a mixture of tea plants, peppercorn trees, rubber trees, cinnamon trees, coconut trees, and flowers such as hibiscus. This was no mono culture plantation; the variety of flora created a delightful beauty. The tour was a short walk up to the veranda of his house where we sat down to drink tea and eat cake and talked tea, Sri Lanka, cinnamon, A Brief History of Tea in Sri Lanka, authoring books, his sons, and such. This man is 69 years old, well spoken and quite witty. 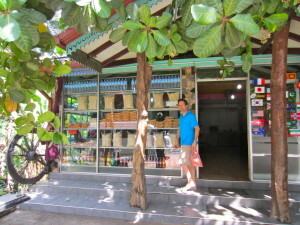 He was in no hurry with us, and we felt quite welcome as guests, and not some tourists to rush through to the gift shop. When we got back to the tour, Herman took us to the factory. 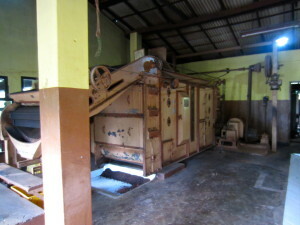 Most of the machinery was original from 1860 and had been made in England and Belfast. This was a working museum of machinery. As we finally made it into the gift shop, they had 25 different teas out for tasting. Gigi and Pearl were quite taken with Herman, and they bookended him on a couch and kept chatting with him. No wonder Herman kept saying how much he loved his job, he was a naturally gregarious and generous person, a great ambassador for Sri Lankan tea. 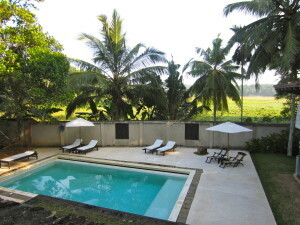 We only just arrived at the Polheena Estate, and I just feel compelled to get my thoughts down. After another long day on the road, stopping to visit a buddist cave temple complex, watching the constant stream of Sri Lankan humanity along the roadside, much of it impoverished, then pulling through the gates to see the rather massive, two story white and black colonial mansion was impactful. 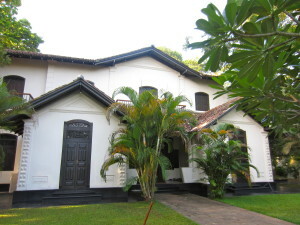 Coconut trees, plumeria, mango and other trees shaded the grounds. Carved stone pygmy elephants stood watch over the pool one terrace below the main lawn, and behind the 7 foot wall backing the pool was a vast rice field populated with water buffalo. A baby buff was standing alone, braying for its mama. We were staying here? 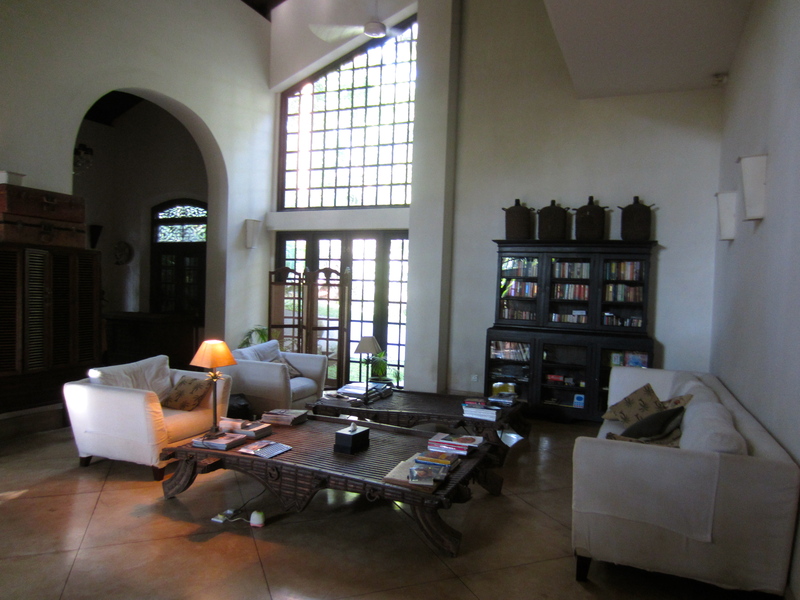 Inside there are 5 bedrooms with four poster beds, an open living room with two story soaring ceiling, and a 180 degree freestanding concrete spiral staircase. ‘Would we be going out for dinner?’ asked the house manager. Heck no, order take out pizza and pick it up with the tuk-tuk. We just ate a late lunch of grilled shrimp, boiled crab and curries at a beachside restaurant for $7.50 a head, a bit of pizza for dinner will suffice. 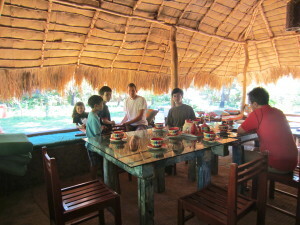 Afternoon tea is served poolside as the kids take to the pool. It has been a humid day, and everyone is sweaty. The back wall has two shuttered windows. I am intrigued, and when I open one window my gaze is met by a black water buffalo munching away not ten feet from me. ‘Do we want our laundry sent out?’ asks the manager. Really, we just want to do a laundry load ourselves, we are really burgeois just pretending for 3 days that we are Lords. Our staff consists of the manager and his wife the cook, a houseboy, the gardener and the security guy. Still, we send a few items out. The kids are doing lap races in the pool now. 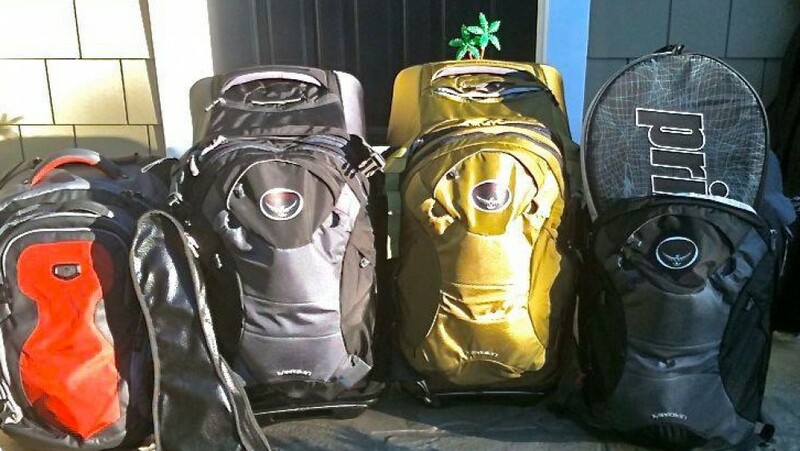 And the price tag is?… $400 a night, split $200 each between families. Not a bad deal. Now, last night’s accommodations may have been a bit bohemian in comparison to where we are now, but we really did enjoy our stay, sandy feet and al fresco everything. Before the mansion, we stayed two nights near Tissa. The attraction in this area is Yala National park, where you go by jeep safari to see leopard, elephant, alligator, deer, boar, elk, monitor lizard, monkey,and many different types of birds. We saw all of these except the crown jewel, a leopard. 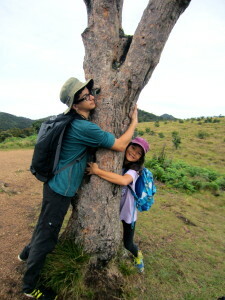 The landscapes were stunning and the wildlife plentiful. When we arrived at Saraii, or should I say almost arrived as the dirt road was too rutted for our van to drive on, we walked the last 100 meters through the dark with our bags. We were in the countryside and it was dark. The place had no formal entrance, the walkways were dirt, the common hut was dimly lit, had one standing fan, two dining tables, a large coffee table and foam mattresses laid out on the low, wide wall enclosing the area. At the common hut, they had dinner ready for us. The food here turned out to be quite delicious and exotic. 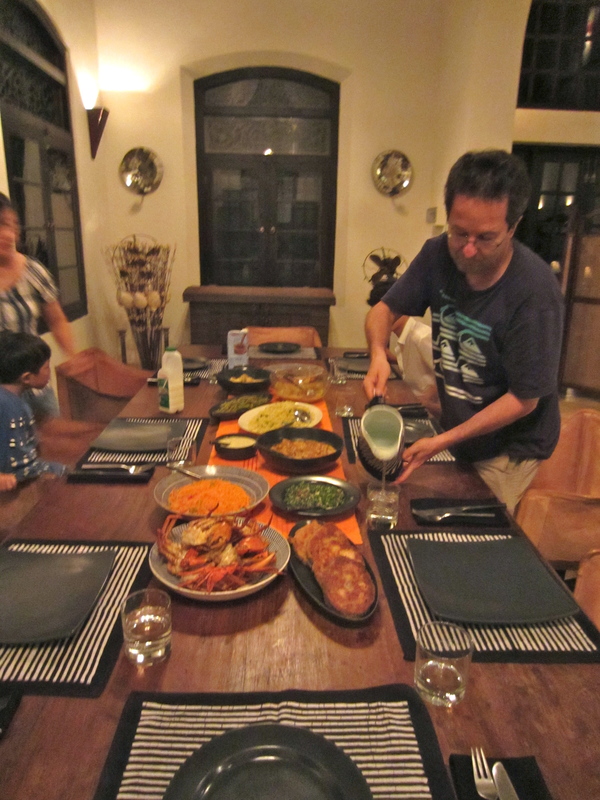 Over the two evening dinners we had giant lake prawns and different curries that contained banana flowers, white cucumber, lotus root, green beans, potato, sardines, chicken, beef, and Dahl. Each meal had 4 – 5 curries with rice. 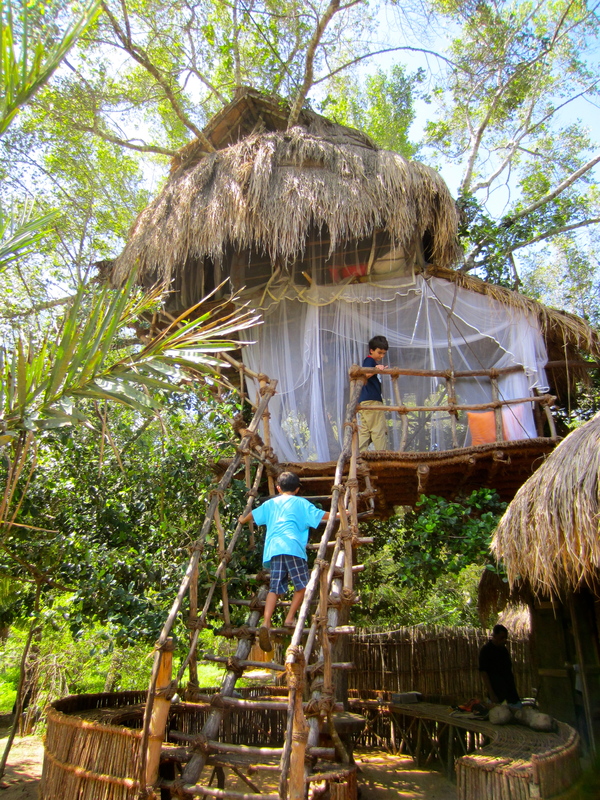 The kids were going to sleep in a true tree house with two levels, woven mats on the floor, palm frond roof, and a ladder handmade from tree branches and rope. The whole house was wrapped in mosquito netting. The mattresses were thin foam. All together a child’s dream place to sleep. We adults got a large room with concrete floor, 3 walls that were mud slathered over brick, the fourth wall was open with split bamboo shades that could be lowered for privacy. The roof was lofty and made of palm fronds. 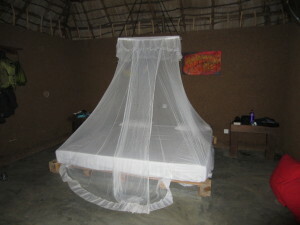 The kingsize bed had a mosquito net. It did have electricity for the one fan, wall plugs and poor lighting. The open air, ensuite bathrooms had western toilets and a shower under a palm frond room and fenced by bamboo mats. This was luxe compared to the mud hut I lived in in Mauritania! The kids loved the place. They chased lizards and caught fireflies at night. 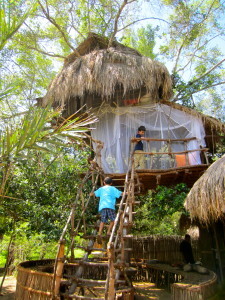 They had pillow fights in the treehouse. The adults definitely prefer the mansion, it is so much more civilized drinking your tea without sandy feet. Hike to ‘World’s End’ – and I forgot my coke bottle! Gigi woke me up at 5:30 AM, and I felt poisoned. Last night was our night out on the town, and I was paying dearly for it. The last time I was this bad was New Year’s Eve 2010 at our friends Ryan and Alicia’s place. I will not dwell on the pain in my head and stomach as I trudged the 7 miles at elevation above 2000 meters. Let it suffice that this author is now on the wagon for the next few days to detox. We had to get up so early because the drive to the park entrance was 1 1/2 hours, passing the highest train station in Sri Lanka along the way. 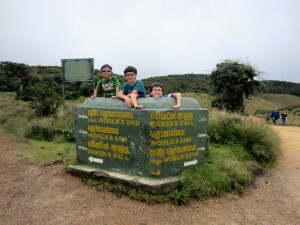 The hike to world’s end was 3 miles through Horton Plains National Park, and we had to arrive before 10 AM because fog rolls into the area daily and obscures all the panoramic vistas. As we parked at the park entrance a 6 pointer (antlers) elk/deer was munching grass within 10 feet of our car. The walk was through rolling grassland along a river that was stocked with rainbow trout by the British. Stumpy rhododendron-looking trees peppered the landscape. The hilltops were lush with forest. The trail was clearly marked, but often it was rocky and wet and muddy. It was cool. I started the hike with my fleece shirt and rain jacket, but well before the end of the hike I had them tied around waist. When we made it to Land’s End we found a concrete platform at the edge of an 870 meter sheer drop. No guardrail. The view was down into a narrow valley with a few small farms in it, the mountain on the other side of the valley facing us. Off to the right was the view of miles upon miles of land falling away. Supposedly, on a clear day you can see the ocean. We did not have such clarity of air, but it was still an impressive view. I really felt that this was the I-will-never-be-so-far-from-home-again moment of the trip. 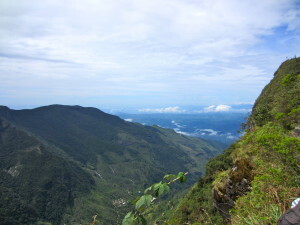 I mean we were smack in the middle of Sri Lanka at an altitude above 2000 meters. 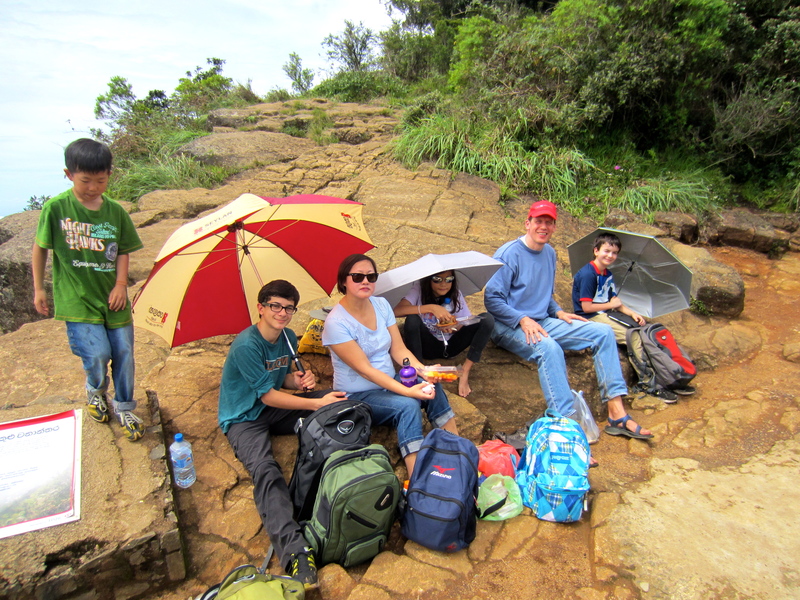 We ate lunch on the platform a good 10 feet from the precipice, and by the time we had finished the clouds had blown in, completely obscuring the view. On the walk back, which was after 10 AM, we began encountering groups of Sri Lankan’s hiking out to World’s End. Today was a full moon holiday in Sri Lanka. That Sri Lanka has a full moon holiday every lunar month was a surprise. We felt a little sorry for these day trippers, they were going to hike all that way and would only see a cloud bank. Oh well, the hike itself was still beautiful. 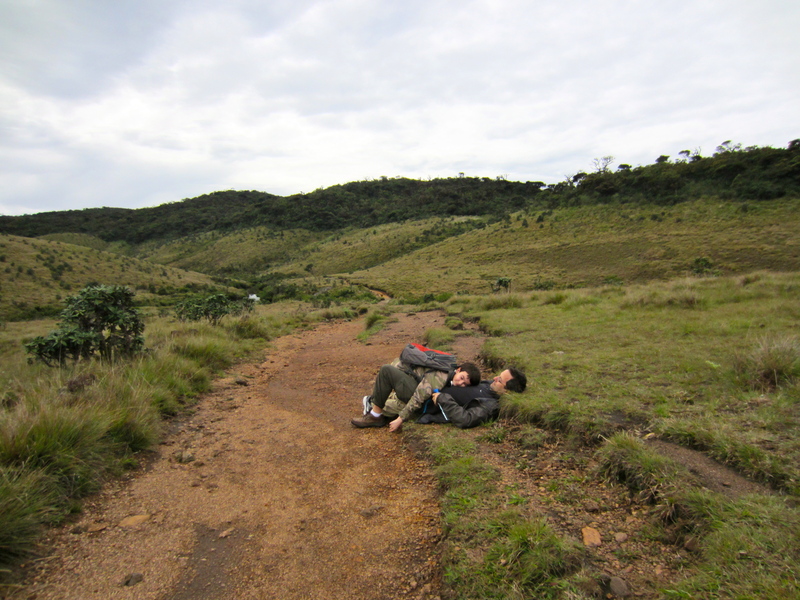 I guess they don’t read the tourist guidebooks that say to get there before 10AM. On the ride back, we passed through one village that was having a real celebration. Everyone was dressed in white and there was a parade with some people at the front holding burning torches. We also passed people preparing a fire walker pit. Now that would have been something to see, but we just did not have the time to stop and wait for it all to happen. 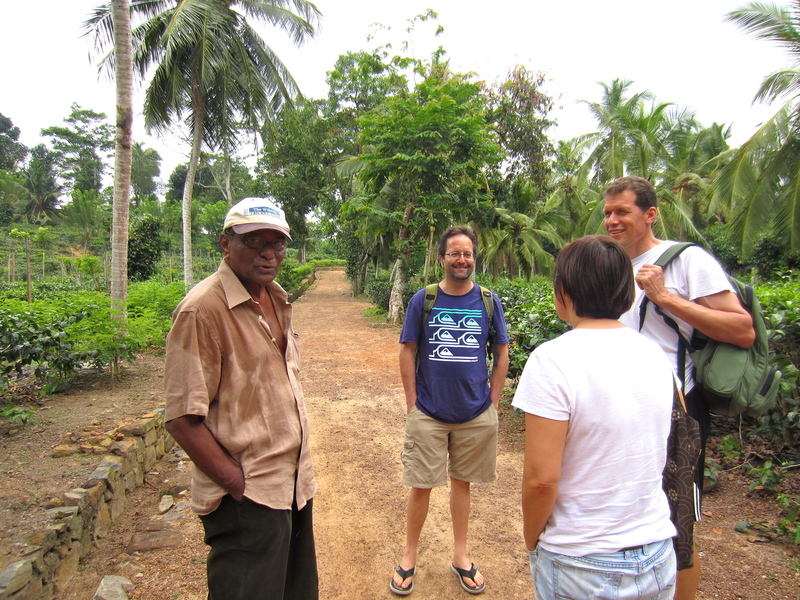 We were driving 4 hours down to the coast to the town of Tissa. Tomorrow, we would be taking a safari ride through Yala National Park. Leopards. elephants and crocodiles, oh my! 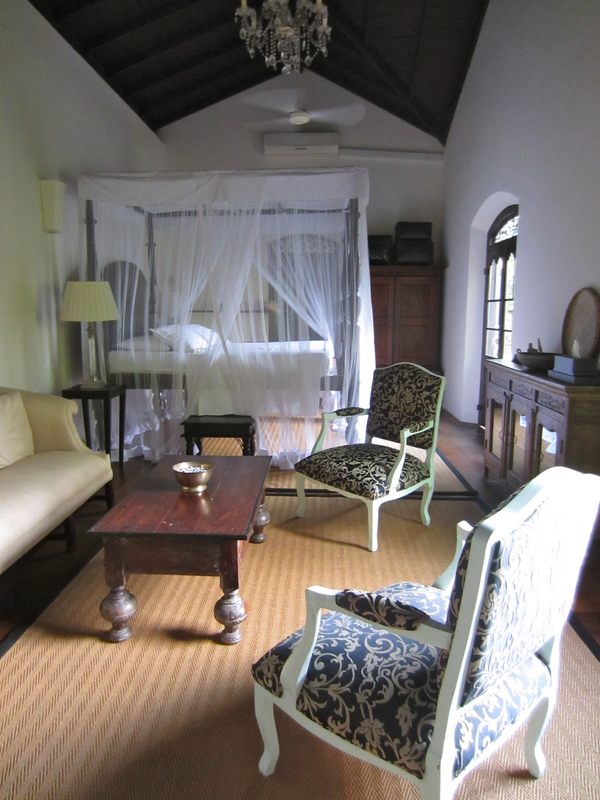 We arrived at our ‘colonial bungalow’ around 3:30 in the afternoon. It was raining, and we were greeted at the door by our umbrella toting host, Wolfgang. Wolfgang is the owner of the property. 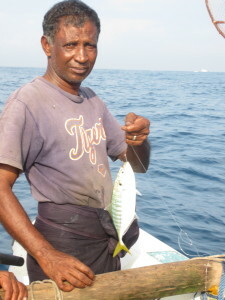 He and his family live in Colombo and normally have a house manager taking care of the guests. The house manager had to be away this week, and as it happened, much to our great delight we found Wolfgang pressed into duty. I started chatting with Wolgang in German, and his reply to my query about where he came from in Germany was ‘one hour east of Cologne.’ Ha! Small World Story coming on! I told him I had worked in the Rothaargebirge, and although I forgot the name of his village, it was in Kreis Olpe, the same county as my village, Heinsberg. The capper to this regional reminiscing was that we both favored Krombacher Pils. Here I am again at what feels like the edge of the world, and I find someone to reminisce with about an obscure corner of Germany. We would only spend 24 hours as Wolgang’s guest, but the whole group found him an excellent addition to our party. In spite of the rain outside, and little knowledge of where we were exactly, Bernie wanted to stretch his legs after the day’s 7 hour journey, almost 5 of which was spent in the van. His goal was to find bottled water, but when I said I would join him, drinking a bottle of Lion Stout accompanied by Diablo cashews as recommended in the Lonely Planet book became our primary mission. We walked the 1.3 km into town on the paved road and found the 5 star Windsor Hotel right on our route. 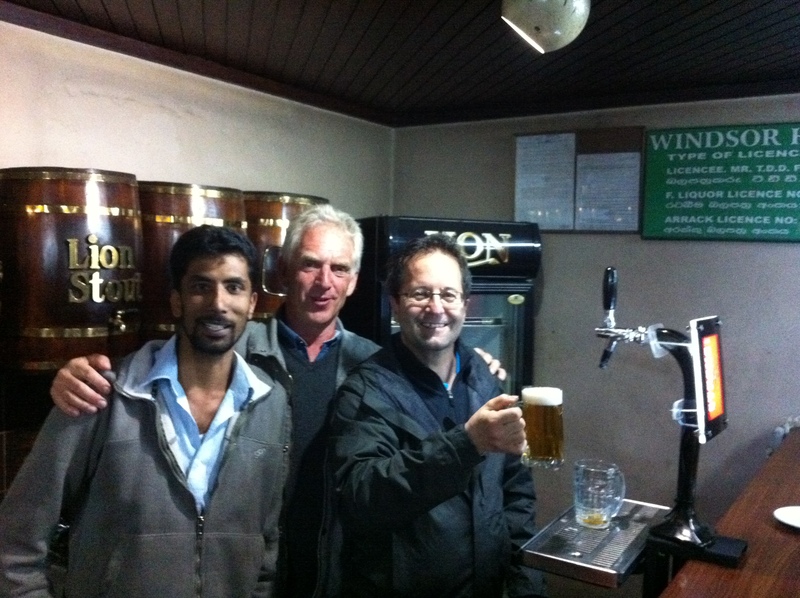 Now, Wolgang told us there were no proper pubs in Nuwara Eliya and that we would have to drink in a hotel, but here on the lower level of the building was a sign ‘Public Bar’. Bernie and I ventured in and found it to be populated with only locals, a few at the bar but most sitting at the tables lining the walls of the square room. 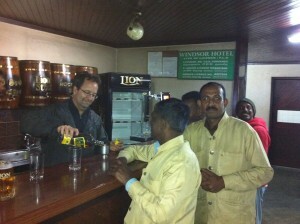 There was a single tap with Lion Strong beer and an assortment of arack liquor bottles. Bernie really wanted the Lion Stout, and the bartender after consulting with a customer pointed to the ceiling and said we had to go upstairs. We went outside, around the corner and up a story to the entrance of the 5 star Windsor hotel. A different world just around the corner. They did in fact have Lion Stout, but the bar was closed. No problem, they opened it up just for us. Bernie and I had the room to ourselves with the bartender. We ordered up the diablo cashews and split a large bottle of Stout. After the first taste, we understood why the Lonely Planet put in special mention for this brew. We soon ordered a second and the cashews finally came, freshly sauteed with spices, curry leaves and garlic. Bernie is a very gregarious person and he soon had our bartender engaged in Q&A ‘Where do you live? How many children? Will you pick your son’s bride?’ This bar had all the western liquor bottles, a large bottle of sake, and even Paul Mason wines. ‘Bery, Bery good wine, from California,’ stated our host. Yes, burgundy, chablis and rosé in liter bottles with a pop cap. There were even a few bottles of french wine, one of them a 15 year old Saint Emilion. Now, that was a good wine if it had survived its long sojourn in the tropics. No matter how fine the wine, however, I was here to experience local brews, so down we went to the Public Bar to try Lion Strong on tap and arack, the local liquor brewed from coconuts. The bartender greeted us with the same large smile as when we came in the first time. One of the cigarette smoking locals slid down the bar away from us as we took up positions, but soon Bernie was deep into his Q&A with the bartender, both of them smiling widely. We were not going to be wall flowers sipping our brews and keeping our distance from the locals. (As an aside, I must say it has been very nice being able to find so many English speakers, thanks to the British Empire.) The bartender introduced us to arack after we asked what the stuff was. People were ordering arack, then a plate of biscuits with butter to go with it. ‘Biscuits and arak!’ became something funny to laugh about. Soon, the real antics started, an experience I am sure the locals will be talking about for a long time. Bernie ducked his long frame under the bar top and asked if he could start serving customers. He did thus for about 5 minutes, getting proper instruction on the filling of 50 cl and 100 cl glasses of arack. A local wandered in and everyone laughed at the shock on his face when Bernie demanded, ‘What are you drinking?’ After Bernie rejoined the rest of us customers, and old man with many teeth missing and a very dirty beanie perched on his head came in and stood next to us. He was not an english speaker. He got right into the mix and offered to buy us drinks. Then we bought him a drink. He counter offered, and when we tried to politely refuse, he pulled out a wad of cash, ostensibly to show us this was no problem for him. The other customers told us he was a goldsmith, and an important man. He sure did not look the part. He was not wearing any gold and his clothes were old and tired. I don’t know what this man was seeing in Bernie, his height or his big smile, or both and something else only he perceived, but he started blessing Bernie by running his fingers through Bernie’s hair and caressing his face, then holding both Bernie’s hands in his in a prayer position. Bernie reciprocated. I got in on the action. This all ended with us having to say goodbye and get back to the bungalow for a curry dinner. Back through the rain, and well, without the bottled water. During dinner, Bernie and I were quite animated about our little adventure. I could see in my family’s mirthful eyes that they were enjoying seeing ‘daddy’ so silly. Wolfgang was attending to us during dinner, and seemed very interested in this bar experience. We said we would go back and show him. Wolfgang was a bit hesitant. but agreed as long as we let him play the part of a german tourist. They do have some sort of caste system here to which I am pretty ignorant, but it was obvious that whites were in a totally different class from the locals, and it seemed Wolfgang did not want to cross this divide. German tourist was acceptable, but local landowners drink upstairs. The three of us fit into the back of a tuck-tuck for the ride into town. It was still raining. The bar was much less crowded when we came back for round two, and we slipped right back in from where we left off. 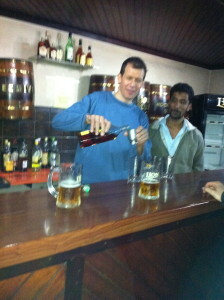 More rounds of beer, another round of arack, I took my turn tending bar. I got a lot more coaching than Bernie did. Apparently, I kept filling the beer glasses too high. ‘Good for the customer, bad for the company,’ the bartender advised. Even the customers we politely scolding my for being too generous. Funny, but you would not get that reaction in America. The bar closed at 11 PM and the three of us staggered home. We were getting to the point where the only way the night’s events could be reconstructed was if all 3 of us put our heads together to remember what was done and said. I paid dearly for this night the next morning when we got up a 5:30 AM to hike the 7 mile roundtrip to World’s End. We arrived in Sri Lanka sleepy-eyed late Sunday night. Sri Lanka is 2 1/2 hours behind Singapore. The international airport north of Colombo is quite small compared to Singapore’s airport. 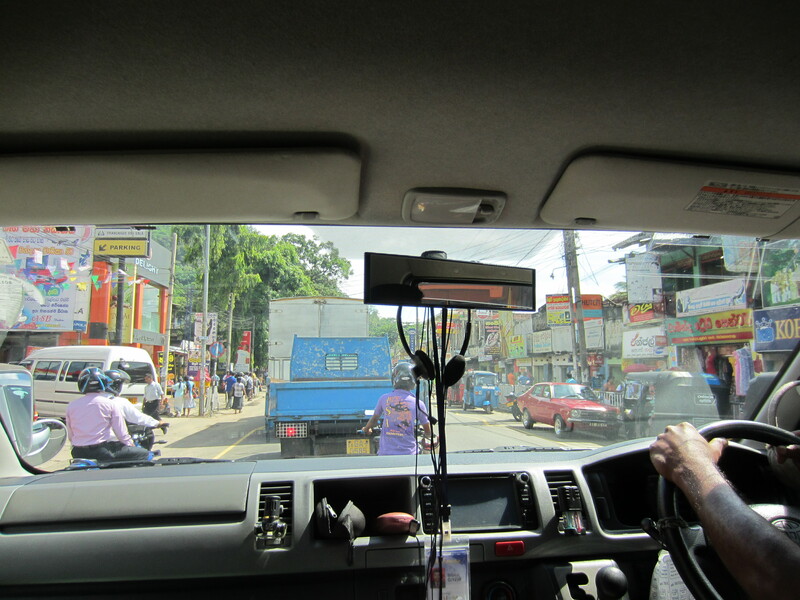 Our driver for our trip, Indra Munasinghe, easily spotted us as we exited Customs. 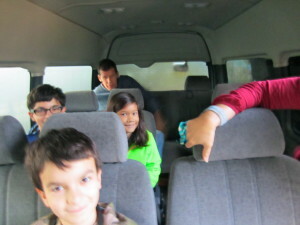 Our friend Pearl had arranged for a 10 seat, air conditioned van with driver for the trip. The cost of this luxury was $900 for 7 days; our half came out to $65 dollars a day. This money was well spent as we covered miles of the country in a roomy, air conditioned cocoon and left the road insanity for Indra to negotiate. Indra was up to the task! He was rarely passed, and deftly passed everything from pedestrians to bicyclists, to cows, to tuk-tuks, to dogs, to busses. And there is no passing lane on these two laned, no divider roads. The center line somehow morphs, Harry Potter style, into a 3rd center lane and everyone is cool with it. A little chicken? Obviously the norm, and Indra never batted an eye or jerked the steering wheel. Calm and focused and capable, he was. We finished our day in the central highlands tea country. We stopped for a tourist lunch buffet and the Glenloch tea plantation. We also took a tour of the ttea factory, did a tasting round of tea, and of course bought some tea: green tea and jasmine tea. This morning had already been a long day with many new ‘firsts’, but the afternoon and evening had more in store for Bernie and myself. Justin has lost 6 teeth this year so far. The latest one came out on the Singapore Airlines flight from London, somewhere over Afghanistan I think. He had to wait until the next evening in Singapore, when he could sleep horizontally, to put the tooth under his pillow for the tooth fairy. The next morning, he had two singapore dollars and a red dragon fruit under his pillow. I guess that is what the singapore tooth fairy leaves for teeth here. Another tooth is very loose. Perhaps this week we will see what the Sri Lankan tooth fairy leaves children. We are leaving for Singapore tonight. Common tooth fairy gifts in countries we have visited: USA – dollars only. very uncreative. France – 2 euros and croissant. Norway – 5 kronor and basket of Valldal strawberries. Sweden – tub of lingonberry jam and 5 kronor. Italy – 2 euros and bag of pasta. United Kingdom – 2 pounds and bag of fish and chips – grease very nasty on the sheets, actually. Birthdays – Who celebrated their birthday in which city? Gigi, Jordan and I all have birthdays within one month of each other. We just had a belated birthday cake for Pearl and Gigi on last night, so we have now finished our families birthday season. Gigi: is still younger than Bob. Celebrated birthday in Singapore by going to the Cirque Le Noir show at the Marina Bay Sands Convention Center. Bob: 51 years old. Celebrated birthday in London by going to see the musical Billy Elliot. Jordan: teenager. Celebrated birthday in Paris by eating out at an Argentine steak house. And not to leave Justin out…we celebrated his birthday back in the summer, sushi lunch in Cirencester, England. We have been in Singapore for a week now. Slowly, we are adjusting to the 7 hour time difference from London, and more significantly, the 90F temps and humidity. We are quickly learning that the phrase, ‘only mad dogs and Englishmen go out in the midday sun’ has great validity. We carry sun umbrellas when we leave the house, hats would not provide enough protection, and anyway, Singaporeans do not wear hats. We want to blend in. We are staying with friends, Bernie and Pearl, and their two children. Gigi and Pearl worked together a few moons ago at Cisco; Pearl actually hired Gigi into Cisco after Gigi had spent time there as a consultant. We went to Bernie and Pearl’s wedding. Our beautiful backyard irises and magnolia bush were gifts from Pearl when she sold her San Mateo house and gave away all her backyard potted plants. Next week is the Singapore American School’s (SAS) easter break week, so today is the unofficial, traditional ‘class rewards party’ day. Justin has been invited to come his new friend’s 4th grade classroom party. This would be a chance for Justin to hang out with a group of his age peers, something that has been sorely lacking on this trip. It took us about an hour to get here by the MRT (railway system), and we arrived just as the students were transitioning into party mode. As we walked in, the students spontaneously clapped for Justin and me. Boy, I felt special. About 10 minutes ago, another teacher walked in the room and the students spontaneously clapped. Perhaps this is just Singaporean student custom. At this moment, Justin is sitting on the class couch next to his friend, munching on popcorn and watching the animated movie Rio. The other students are draped around the room, lounging on the floor on pillows, sitting on their desks or in their seats. Pajamas have been slipped into. It feels good to be back in a classroom, and not just because it is air conditioned. This room could be in Justin’s old elementary school. The teacher has a Promethean board, desks are arranged in squares of 4, baskets of books; teacher made posters about reading, classroom behavior, the writing process. I found the Gary Paulsen book basket and held Hatchet in my hands. I taught this book for many years in my 7th grade classroom. Who knows, maybe I will find myself teaching in a 4th grade classroom come September. I don’t know why, but I did not blog at all while we were in London for the past 2 weeks. I will have to get some stories and pics posted about our time there. 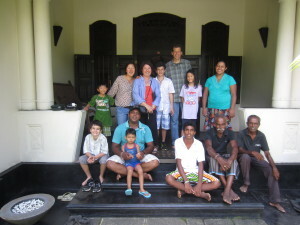 We are now in Singapore staying with our friends Bernie and Pearl and their children, who are 7 and 10. Justin and Jordan finally have some playmates. Yes!